This month’s spotlight shines on nationally-recognized health IT leader Sue Schade, a principal at StarBridge Advisors and one of the driving forces behind its new C-change professional development service for women in health IT. Sue is also the author of the popular Health IT Connect blog, and host of the next #healthITchicks tweet chat, which will take place on Wednesday, April 17 at 1pm ET. What health IT product, development or trend excites you right now? At StarBridge Advisors, we not only work with healthcare provider organizations but also talk with a lot of startups that are solving a range of niche problems. They have early investors and pilot sites. It is interesting to watch which ones will ultimately be successful, get the necessary funding and develop a solid client base. And to understand why they are successful when other startups aren’t. For every 100 startups that investors look at, they invest in only one or two. That means all those other potential solutions to real problems in healthcare may not make it to market. I remember a startup that came to pitch to me back in 2015 when I was CIO at Michigan Medicine. I thought their product had a lot of potential, and asked our VP for ambulatory services if she was interested in exploring. While we didn’t pursue at the time, that vendor now has a suite of solutions and a large client base that includes many leading health systems. Their core solution was modeled off a system used to book airline travel. It’s a great example of how much healthcare can learn from other industries. Digital health and patient engagement continue to evolve. Seeing the $300M-plus investments that Walgreens and CVS are making in digital health, and the progress that many healthcare provider organizations are making is exciting and something to watch in the coming year. From a patient’s perspective, how have you seen health IT personally impact your healthcare? Fortunately, I am in pretty good health. I did finally seek treatment last year for back and hip pain that I had put up with far too long. (A lesson in taking care of yourself!) I ended up doing six months of physical therapy. The seamlessness of scheduling appointments and coordination with my PCP was possible due to their integrated EHR. I have relatives being treated for more serious medical issues at one of the leading healthcare systems in the country. While they are loyal to the physicians and clinical care they receive, I know that the patient-centered tools available to them are making this health journey much easier for them. At the same time, I can share that my husband is currently trying to work out a prescription renewal between a PCP and specialist in the same healthcare system and the pharmacy but keeps getting bounced around. That’s an example where coordination and communication are not working. What’s on your health IT and/or professional development calendar in terms of conferences and/or webinars? April is busy! I’m looking forward to participating on panels at the Healthcare and IT Marketing Conference (HITMC) and the “Lead. Represent. Mentor.” Conference in Boston. I’ll be moderating a panel on AI in Healthcare at the Ocean Inno Tech Fest here in Rhode Island. And I’m putting together an all-women panel of CIOs to talk about digital health and patient engagement for the Expo.Health conference this summer. Whenever I have an opportunity to speak at an event, I always learn a lot from all the other speakers and panelists, and so I’m definitely looking forward to these upcoming events. You recently launched C-change through StarBridge Advisors. Why did you decide the time was right to offer women in health IT this resource? I still often find myself the only woman in the room or on a call. That should not be. Things have changed significantly, and for the better, since I started in health IT management over 30 years ago. Men are far more supportive of women now. Men and women share more family responsibilities. Company policies are more family-friendly. Women are given more opportunities and encouraged to advance their careers. But, we still have a long way to go. There is still a difference in how women are viewed compared to men. Words such as bossy, aggressive, or emotional are used to describe characteristics and behaviors in women that would be considered strong leadership in a man. Men are considered for a new position based on their ability to stretch and learn something new, versus women are often selected when they’ve already demonstrated their abilities. While women may lack confidence in themselves, being the “only” can make it that much harder. We want the next generation to take advantage of opportunities from a place of confidence and internal strength. While we look forward to a world in which male and female socialization is the same and people can be wholly themselves without encountering stereotypes and structural power imbalances, we’re not yet living in that world and the burden falls disproportionately on those who are not white males to figure out how best to be effective while evolving the model. On top of that, as women we can be our own worst enemies – with a strong inner critic often holding us back – which makes it more difficult to address the remaining hurdles to our progress in the external world. Given that, we seek to support women to cultivate in themselves a strength, confidence, groundedness, and clarity of intention to weather the world as it is and be effective with who they are. From there, we wish to help them build on top of that internal foundation a set of practices and relational skills that enable them to be most effective in their roles. I’m passionate about developing next-generation leaders. I have a particular focus on developing women leaders. I’ve done a lot of speaking and writing focused on women, including my weekly blog Health IT Connect. So C-change was a natural next step for the work I’ve done the past several years. What are you looking forward to chatting about during the #healthITchicks chat on Wednesday, April 17 at 1pm ET? 1. Femtech and female-centered healthcare services are making headlines now more than ever. How have you seen a woman’s perspective shape healthcare products and/or drive startups? 2. What does it mean to be the only woman in the room? How do you act in this situation? Background reading: A Seat at the Head of the Table by Emily Bazelon in the New York Times Magazine, and a book titled “The Only Women in the Room – Why Science is Still a Boy’s Club,” by Eileen Pollack. 3. How real is “the confidence gap” for you? How do you address it in your own work? Background reading: The Confidence Gap by Katty Kay and Claire Shipman in The Atlantic. 4. What advice would you give women who are early in their career? Background reading: Four McKinsey leaders share their advice for early-career women from McKinsey & Company. 5. What type of professional development resources do you find the most valuable? How have they impacted your career trajectory? 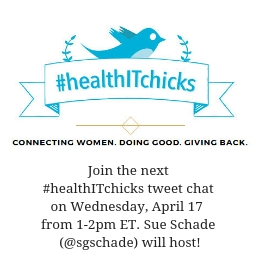 Join Sue Schade (@sgschade) on Wednesday, April 17 at 1pm ET for the next #healthITchicks tweet chat. You can also connect with the community on LinkedIn via the #healthITchicks group.